NEW YORK—The dollar extended its rally against a basket of currencies on Wednesday to touch a five-month high, supported by relatively strong U.S. economic data in recent days, while the euro was hit by reports that a likely future Italian government would seek debt forgiveness from European creditors. 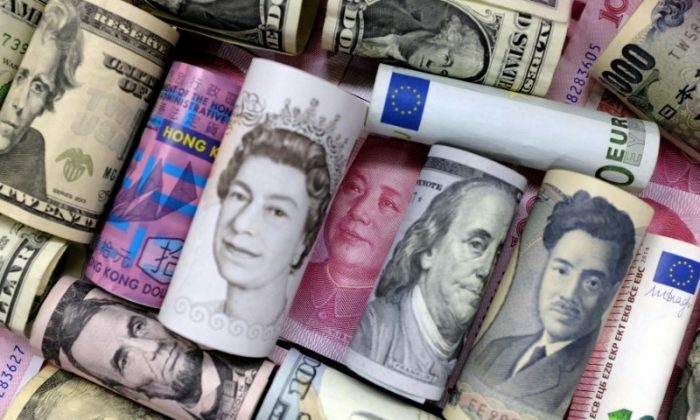 The dollar index, which measures the greenback against a basket of six other currencies, was up 0.14 percent at 93.352, after rising as high as 93.632, its highest since December 19. The greenback has risen about 1.6 percent this month, boosted by a view that the Federal Reserve will outpace most major central banks in policy normalization. The euro was 0.25 percent lower against the greenback at $1.1807, its lowest since December, after reports that Italy’s anti-establishment 5-Star Movement and anti-immigrant League may ask the European Central Bank to forgive 250 billion euros ($294.18 billion) of debt. “The reaction that we saw in the market definitely reflects the investor sentiment about that,” she said. The euro was 0.4-percent lower against the Swiss franc, after dropping to a five-week low of 1.1772 francs. The Swiss franc typically attracts capital in times of uncertainty. Emerging market currencies suffered more losses on Wednesday with the dollar’s rise, although the Turkish lira pulled back from record lows after the central bank said it would intervene to stop its slide. Sterling fell towards its lowest point of the year against the dollar amid fresh worries about Britain’s Brexit negotiations and relatively modest UK wage growth, but pared losses to trade little changed on the day at $1.3495.